This control room is 60 feet by 9 feet. It was prefabricated in our plant in two sections to respect road transportation constraints. It is what we call a «Plug and Play» cabin. The first section of the cabin hosts the local control cabinets (LCC) whereas the other section is for the machine operators’ office. It achieves a sound reduction of 40 decibels with pre-installed HVAC and A/C. 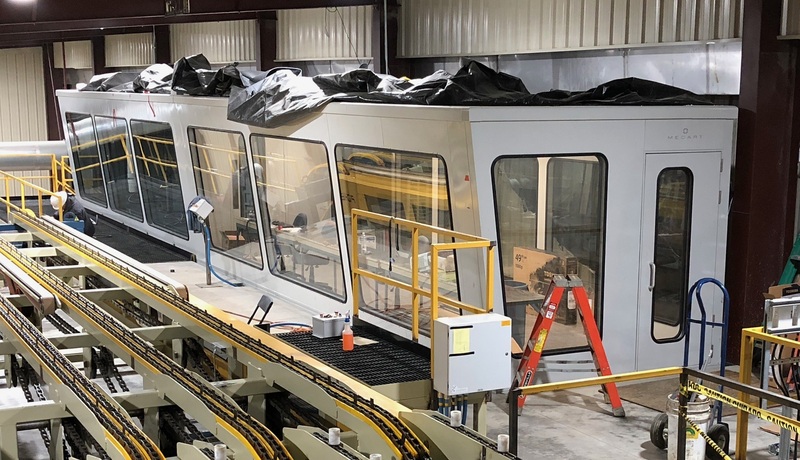 Operator visibility on the production line was paramount so the customer chose a flush-glass design with a minimum of mullions. The acoustic performance of the room is not tampered by the abundance of windows, which reduces noise by about 45 decibels. It also has both a fire protection system and air conditioning system integrated into the cabin walls. Watch Sophie demonstrate the acoustic performance of the control room! The structure of this prefabricated cabin has been solidified for a safe journey to the US. The operator’s visibility was important so we used an inclined window on the front of the cabin. Most importantly, the cabin reduces noise by 45 decibels with an entirely integrated and non-apparent HVAC system. 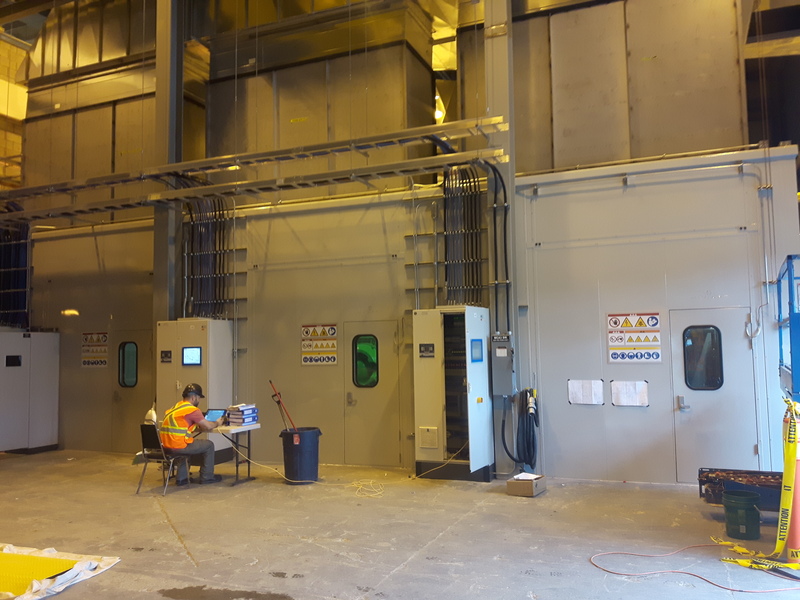 This small operator booth, which yields an acoustic reduction of 35 decibels, is installed in a paper mill. At the request of the customer, it was equipped with a water-conditioning system. Because of space constraints, we designed the office to optimize the limited working area. There are several windows to ensure the supervisors have good visibility over the machinery. The cabin reduces ambient noise by 35 decibels. The floorless design uses the client’s concrete floor. The panels were prefabricated at our plant but assembled on site with our hook and seal system. 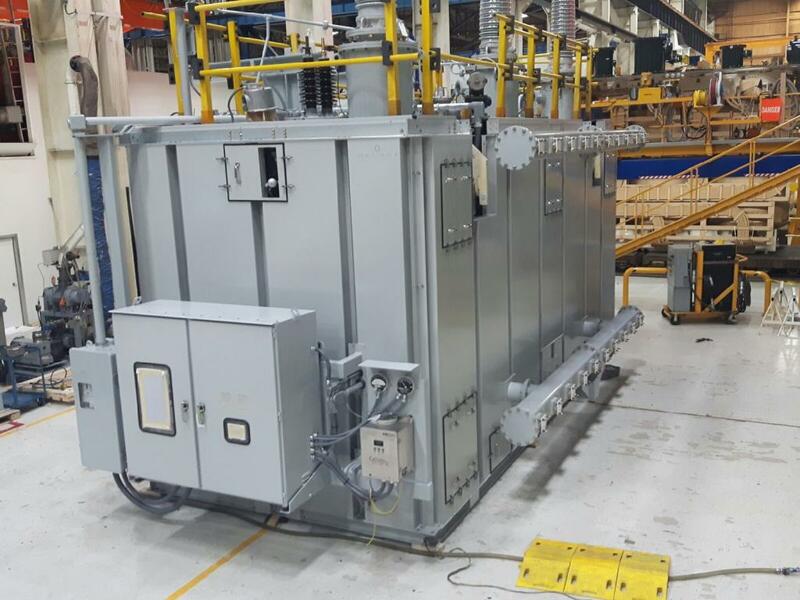 This partial transformer enclosure with four acoustic walls gives an acoustic reduction of 8 decibels. A weatherproof membrane also contributes to the acoustic insulation of the transformer. 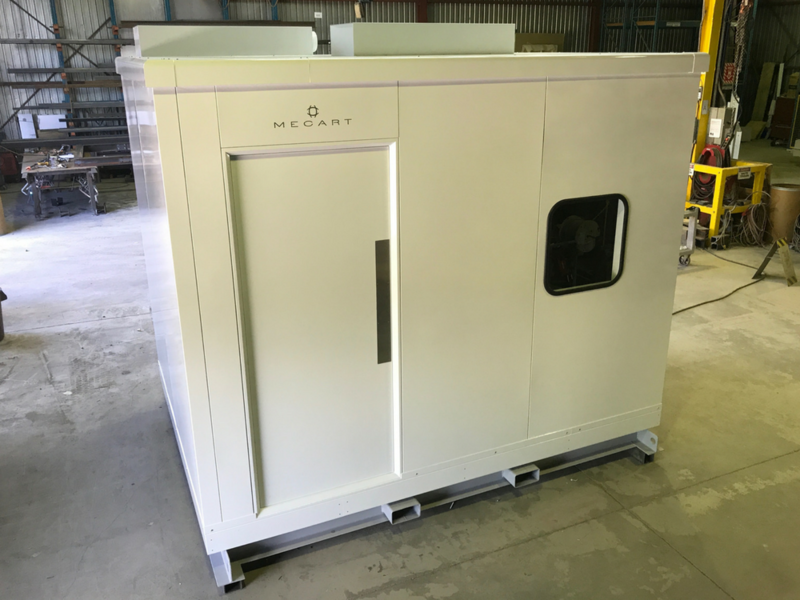 MECART also designed and manufactured the structure with a vibration damping system. 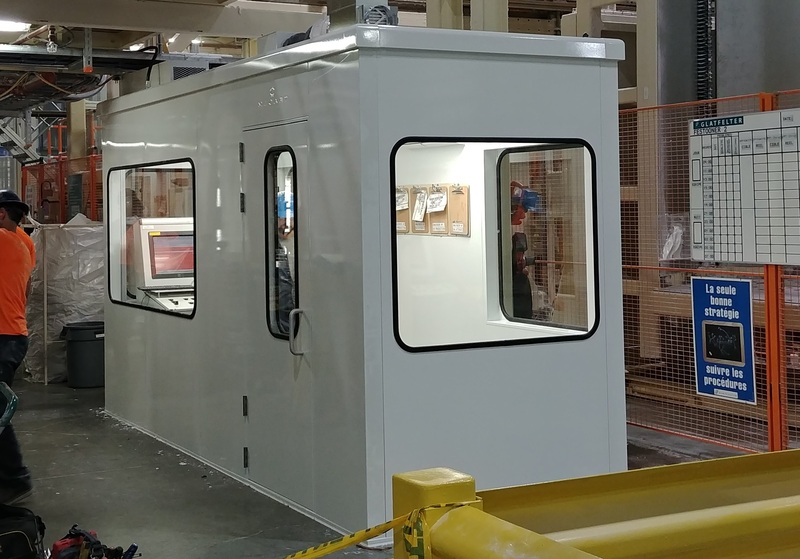 These enclosures host 3 generators and reduce noise by approximately 45 decibels. There are several beams inside to be used for hoisting or piping and interior partitions separate the generators. The front walls are fully demountable to easily remove big pieces if needed. The silencers’ air intake and outlet supplies an airflow of approximately 36 000 CFM per enclosure. 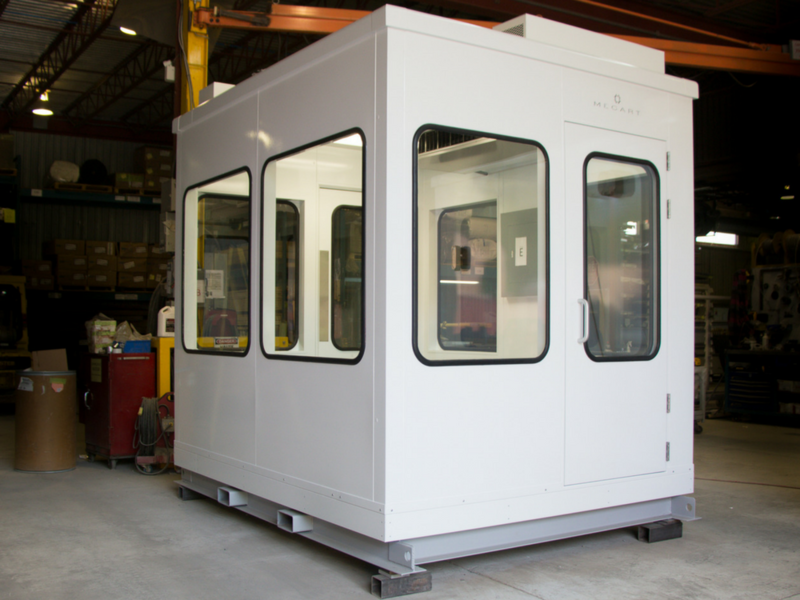 At Mecart, we design all kinds of modular buildings! This one is a test cell for an aircraft engine. It was custom engineered by our team according to the client’s needs and specifications. This test cell reduces the noise produced by the engine by 45 decibels, and deals with both high and low frequencies. This pneumatic sliding door includes an electromagnetic safety lock connected to the robot. The door locks automatically when the robot is in operation. The door also includes a safety edge and a sliding curtain with an anti-flash filter to protect from welding rays when the robot operates with the door open. The structure reduces the sound level by about 35 decibels. This sound recording studio was used for a Hollywood production movie being filmed in Montreal. Unfortunately, we are not at liberty to give any details about the set, what we can tell you, is that the studio is equipped with lifting points, making it easy to be moved by a forklift when necessary and that the studio achieves an acoustic reduction of 45 decibels.